Teachers need to have name tags as well! Thanks to the endeavors of the Name Tag Wizard, now we offer custom name tags for tutors too. From daycare providers, to college campuses, we’ve got lots of possibilities to keep your team happy! Simply being a educator is tough, so it’s nice when one of them gets special recognition for their time and energy so what better method to achieve this than with the help of a custom name tag? Come time for those troublesome parent teacher conferences, parents and guardians will be relieved about not having to worry about remembering their child's teacher's name when they see the custom name tag displayed with great pride! We supply a wide array of stylish designs, with a lot more not far off! 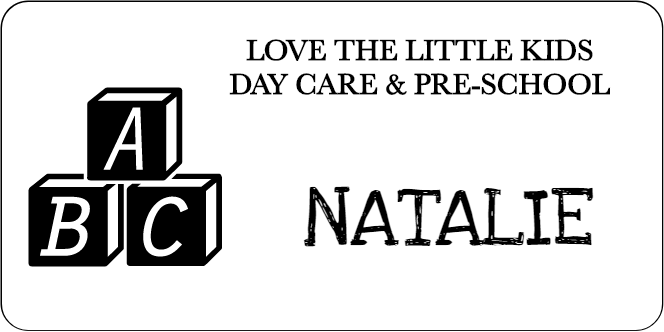 Buy your new Day Care ABC One Color 3 Line Name Tag today!